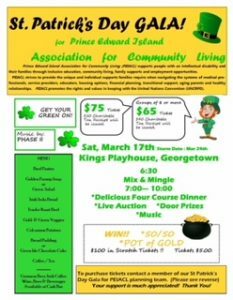 Come join us on Saturday, March 17th, 2018 for our St. Patrick’s Day Gala at the The Kings Playhouse located at 65 Grafton Street, Georgetown, Prince Edward Island C0A 1L0 Show Map. Meet at Greet starting at 6:30 p.m. Dinner at 7:00 p.m.
A delicious Four Course Dinner, Live Auction, Door Prizes and Music by Phase II. Tickets: $75.00 per person or group of 8 or more people for $65.00 each person. Please contact any of the following people to purchase tickets. 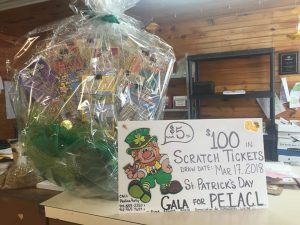 A great way to celebrate St Patrick’s Day and support PEIACL. Please share with anyone who would be interested! Members of the PEI ACL Board of Directors showing off the Pot of Gold Basket filled with $100.00 worth of Scratch tickets. Tickets are $5.00 each and can be purchased by contacting one of the following members.